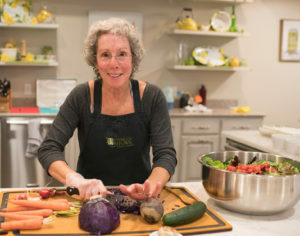 In this ongoing seasonal cooking class series, Wendy Van Wagner of In the Kitchen, and I will be partnering up again to offer another informative, fun, and delicious heart-healthy cooking class. This class, which will focus on Fall Foods, has filled up quickly! I am thrilled with the enthusiastic response to what has become a series–we’ll offer these heart-healthy cooking classes four times a year (at least!) to take advantage of the variety of delightful and delicious foods that are available on a seasonal basis. Stay tuned for the winter class to be offered in January, 2011!